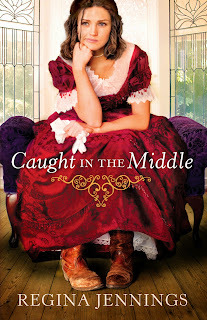 Book Review - "Caught in the Middle"
"Caught in the Middle," a novel by Regina Jennings, is a fun read and fans of Regina will not be disappointed. I loved jumping right back into this series and getting to spend more time with Nick and Anne and really getting to know them. Anne is living or more like hiding out until she is forced to be in town and then is left to care for a baby. As Nick is also in town and these two know each other, the logical thing is for them to team up; however this is difficult for both of them in many ways and also adds conflict as they are forced to address their relationship. I have really enjoyed this series and once again Regina has created a wonderful book! I love the cover, I have since I first saw as it is a perfect portrayal of Anne and how she feels about her life. Nick and Anne are both excellent main characters and I loved this journey that brings the two of them to partnering up together. I highly recommend this book (and the previous 2 books in the series as well!) to historical fiction fans. Amy Clipston has written another excellent Amish fiction book! "A Mother's Secret" is a book that does not have a "typical" Amish woman as the main character as so many of the Amish novels do as Carolyn is thirty-one years old, has never been married and has a teenage son. I really enjoyed this book and also that it was not the typical Amish fiction novel. Carolyn was very easy to relate to throughout the book. She is seeking for love and to have that picture perfect life of having a husband whom loves her and her son and their own home. However, she feels unworthy of this and has the guilt and burden of secrets that she has been holding on to. I really enjoyed the characters and the storyline and I was immediately drawn into Carolyn's life and into the story. I highly recommend this series to Amish fans! Book Review - "All for a Sister"
"All for a Sister," a novel written by Allison Pittman, is a must-read for historical fiction fans as it brings the roaring 20's to life! Allison does an incredible job with recreating the time period as the backdrop for the story and I have always enjoyed learning about the 1920's therefore this was a book that I was so excited to read as soon as I saw the cover and read the description of it and I was not disappointed. Celeste is living her dream, she has lived a privileged life and is able to pursue her dream; however secrets are being uncovered after her mother passes and a letter is found and the inheritance is divided. This story is filled with great characters, an intriguing storyline that completely captures the readers' attention and I found myself not wanting the book to end! Book Review - "Blind Trust"
"Blind Trust" is book 2 in Sandra Orchard's Port Aster Secrets series and this continues along in the lives of the two main characters whom we met in book 1, "Deadly Devotion." Kate was a victim of attempted murder and before this case is even settled in court, she once again finds herself in the midst of trouble as she is caught trying to buy groceries with some counterfeit bills. As Kate and Tom are once again trying to sort out details and get to the bottom of the crime, their feelings have also become more personal and yet the situations they find themselves in are interfering with their personal relationship. I really enjoyed book 1 in this series and book 2 is great as well! I love that it jumps right back into the action right away on page 1, but also gives a little "refresher" to what occurred in book 1 as well. Sandra does an excellent job of trying together romance and suspense and also parallel storylines. I highly recommend this book to romantic suspense fans and am looking forward to book 3! Quilts of Love | RIVAL HEARTS – Summer Coleman Camping Kit Giveaway! Tara Randel is the author of five romance novels including Lasting Love, Melody of Love, and This Time Love. A member of ACFW, Tara is also the lead author of the new Annie's Mysteries series (see AnniesMysteries.com). Tara lives in New Port Richey, Florida. I really enjoyed "Rival Hearts" as it is a sweet, and fun story to read with characters whom you cannot help but love and become completely involved in their lives. Both Ben and Molly want/need to win and they each have their reasons. The competition that these two are in help them to see what they actually are able to accomplish themselves, and their self-confidence develops and also issues from their pasts are addressed and worked through. I really enjoyed reading about their attempts in fields that they are not all that comfortable with and how they gave it their all in order to try and meet a goal. I highly recommend this series and specifically this book if you are looking for a quick, sweet, summery read! Book Review - "Third Thursday Community Potluck Cookbook"
I love the entire concept behind this book - food and fellowship, but it goes even beyond that as it is a group dinner/community potluck each month that highlights the foods that are in season at that time. What an awesome way to try new recipes for in season foods and what better foods to eat than those that are fresh and readily available from a local farmer's market or even better from your very own garden! This book is divided into sections by each month and there is a variety of recipes and I cannot wait to try so many of these! Also, the pictures included throughout the book of the foods are beautiful, they make the food so appealing! This is such a fresh, new approach to potlucks and an excellent idea for a cookbook as well! First of all, just look at this cover - I love it!!! "Treat Yourself: 70 classic snacks you loved as a kid (and still love today)," by Jennifer Steinhauer, really is just that - a book filled with recipes of treats that we all have enjoyed throughout our lives. There are recipes for Chips Ahoy cookies, strawberry pop-tarts, cheez-its and zebra cakes, just to name a few. I love the layout of this book too as it is very easy to read and there is amble space for easy recipe, including pictures of the recipes as well. I like the little blurb that is included with easy recipe as well and you will be taken on a journey down memory lane with this book! I am looking forward to trying these recipes with my children and creating new memories! AND if you want a sneak peak into the book and also a few recipes (yes you do!) go here! Book Review - "I need some help here!" Kathi Lipp has written just the book that speaks to my "mommy heart." "I need some help here! : hope for when your kids don't go according to plan," is a book that will help each and every parent to not feel so alone, to encourage through moments of despair and provides advice for various situations. This book is so honest and straight-forward, so much so that I feel as if I am sitting face to face with Kathi and we are having a nice little chat over mugs of coffee. Kathi shares and I "listen" and then think about and talk through things in my head. It is so easy to worry about our kids, especially when they are sick or beginning something new or when they are misbehaving and Kathi addresses all these areas and more. There are so many good reminders in this book, especially that we are not alone and neither are our children, as we have God guiding us and leading us through life. I have a feeling that this is a book that I will revisit many times and look through at the points I have underlined and marked. 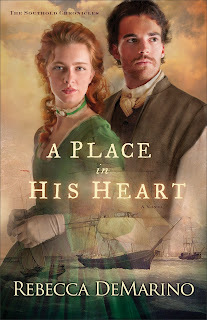 Book Review - "A Place in His Heart"
"A Place in His Heart" is a fantastic start to Rebecca DeMarino's The Southold Chronicles series! Rebecca has based this story on her ancestors and I love the "authentic feel" of the story and just the fact of knowing that it is based on real live people just added extra appeal as well. Mary is pressured to marry Barnabas and Barnabas is still devastated over the death of his first wife. Both of these individuals are filled with heart-ache, confusion and trying to move on in life, but Mary also longs to be loved and it is not appear that Barnabas is going to be able to love again. This is a story of moving on in life, but also really looking at the relationship between Mary and Barnabas as there are secrets and pieces of themselves that they keep hidden and hold back from each other. I found myself empathizing with Mary throughout the story and felt a connection with her and also some of the minor characters as well whom I hope will be a part of future stories in this series. I highly recommend this new author and new series to fans of historical romance! "Forever Amish" is book 3 in the Legacy of Lancaster Trilogy and this is a great conclusion to the series. Kate transports the reader to Bird-in-Hand, near Lancaster, and I love this setting as I would go their every summer with my family while growing up and have fond memories of these trips. This book has a great storyline and I was immediately drawn into the story and the characters' lives in the very first chapter as Sally has made plans to go to Lancaster unbeknownst to her father and elements of their relationship come out just in their discussion including the care and love they feel for each other, but also that there are secrets as well. Sally is questioning whether she should marry her fiancée and this trip allows her to see a whole new life, but also helps Sally to learn about herself and discover some answers to questions she has had. I highly recommend this book to Amish fiction fans, but also those whom enjoy a sweet Christian romance. I have really enjoyed Colleen's Hope Beach series and "Seagrass Pier" is a great addition to the series! The setting is beautiful and a perfect backdrop for these stories and I have loved the characters in each of these books and I love that we get to "revisit" some of the characters once again. Elin and Marc are both strong main characters and they are so easy to connect with right away. Elin's kindness and loyalty shines through with her relationship with others, especially her mother and her daughter. Marc is a honorable man and one whom take his roles seriously and I love that these two are reconnected to work together on this case, but also reconnected personally as well, especially since they have a daughter together. Colleen is one of my favorite romantic suspense authors and I highly recommend "Seagrass Pier" as well as books 1 and 2 in this series, "Tidewater Inn" and "Rosemary Cottage." "Happy to be Alive, Because"
Avery is a seventeen-year-old girl whose reality has just been shattered by the death of her mother. Feeling a desperate need to flee from what has become her life, she follows a travel plan meant for her mom and her that leads her to the little beach town where her mom grew up. It's there that she meets a group of three adventurous friends who adopt her into their circle, allowing her to experience a summer she never thought would be possible after suffering such a great loss. Unfortunately, her summer full of experiences threatens to end abruptly when she realizes that one of the three has a secret that causes her to question everything about the new life she has been building. Avery must learn to balance her grief and her desire for a future in order to achieve her mother's final wish for her: That she would be happy to be alive. Chelsea grew up with an immense love for words---both reading them and writing them. She obtained her degree in English and has spent the time since then getting married to her high school sweetheart and chasing adventure so she'll have something to write about. When she's not drinking copious amounts of coffee while writing, she spends her time reading, playing with her puppy named Gatsby, and dreaming, always dreaming. I really enjoyed this book, it is a journey of self-discovery, working through grief and trying to find happiness, real happiness in life. This is a quick summery read, light at times and yet soul searching as it addresses thoughts and feelings working through grief and coping with the death of one's mother. The story line was sweet with Avery discovering the travel plans made by her mother and the journal as this was another chance for Avery to be connected with her mother. This is an excellent story that will remind the reader to treasure life and each moment that we are given with our loved ones. Book Review - "The Hatmaker's Heart" & Contest info! Carla is hosting a Jazzy Hatmaker's Heart Giveaway on her blog - for more information go here: contest! I love reading books set in different time periods and I have always been fascinated by the 1920's; therefore I was really looking forward to reading "The Hatmaker's Heart." I was not disappointed in the least! Carla has created an excellent story that is fun to read and set in an equally fun time period! This is such a different book as it delves into the work of creating hats, which the wearing of hats was the fashion trend back then (and one that I wonder will come back someday). In the very first chapter, so much is learned about Nell from her interactions with coworkers and also clients from her speech impediment, her family background and her eye for detail and fashion, not to mention the kindness and compassion she shows to others. I was immediately drawn into the story and did not want to stop reading once I started. Also, I love the cover of this novel, it is eye-catching and just perfect for the story! OUT OF THE RUINS | Kindle HDX Giveaway & Facebook Party! Abby's shattered faith in both God and man is challenged when the terrible earthquake hits 1906 San Francisco. While her sister lies on her deathbed, Abby Fischer prays for a miracle. What Abby doesn't expect, however, is for God's answer to come in the form of the handsome Dr. Robert King, whose experimental treatment is risky at best. As they work together toward a cure, Abby's feelings for Robert become hopelessly entangled. Separated by the tragedy of the mighty San Francisco earthquake, their relationship suddenly takes a back seat to survival. With fires raging throughout the city, Abby fears for her life as she flees alone through burning streets. Where is God now? Will Robert find Abby, even as the world burns around them? Or has their love fallen with the ruins of the city? Karen Barnett is a new author to me, yet based on what I have read she is one whom will be on my must-read list! "Out of the Ruins" is the first book in Karen's Golden Gate Chronicles series and I am looking forward to reading book 2! Karen has done a fabulous job with bringing the time period to life in this book as she transports the reader back in time to the early 1900's and also a historical event as well. I loved her style of writing and the details and imagery that is a part of the writing as they really created the scenes in the story and brought everything life. The characters were also so lifelike as were their interactions with each other and I enjoyed "seeing" the relationship between Abby and Robert develop and grow. I highly recommend this book to historical romance fans! "All My Belongings," written by Cynthia Ruchti, is an emotional read that will immediately draw you into the story. Jayne is trying to move on with her life and away from the stigma of her family; Jayne is now Becca and ready to start over as a brand-new person with a brand-new life. Jayne turned in her father and his criminal record will remain a part of her unless she becomes someone new, apart from her family. Becca is trying to balance keeping her past hidden and fitting into her new life, yet she is longing for love and will she be able to have a true love without revealing her past? This is such a well-written book that is filled with heartache, longing, love and hope. I really enjoyed reading this book as Jayne/Becca tries to find her way in life and from whom she can experience true love and peace. Jayne/Becca is a character whom the reader cannot help but empathize with and love and Geneva is such a loveable character as well and she has such a wonderful friendship with Jayne and plays a vital role in her life. This is a book that need to be on your summer reading pile! Book Review - "Finding Spiritual Whitespace"
"Finding Spiritual Whitespace: awakening your soul to rest," by bonnie Gray is a refreshing and much needed journey for me and I am sure many many others. This is an incredible book that I really enjoyed reading and it is one that I will page through again. The book is divided into 6 main sections and each chapter within these sections focuses on a specific point and includes "prompts" and questions to really help apply the chapter in one's own life. Allowing ourselves to rest and refocus is so important yet something that is pushed away as life is so busy and there is simply not time; however this is not benefiting us and Bonnie shares her story and thoughts that will encourage each reader to really find that whitespace. Book Review - "A Woman of Fortune"
"A Woman of Fortune" is book 1 in Kellie Coates Gilbert's Texas Gold series and it is the first, but most definitely not the last, novel of Kellie's that I have read! I was immediately drawn into the story and did want to put down the book as I had to keep turning the pages to know what would happen next! The Massey family is living the dream - they are billionaires, Claire and Tuck have a happy marriage and great relationship, Garrett works for his father and is married to the perfect wife, Lainie is engaged to the future senator of Texas and Max is finding his way in life veering off the path that his siblings have taken, but he is still around and involved with the family. Suddenly in an instant the Massey family is turned upside down when Tuck in arrested during a very public event. Claire does not know how her life has turned out like this and if she even knows her husband. Each family member copes with this incident in his or her way; however with the family bond that has been there for years continue or is this too much to bear? I really love Kellie's style of writing as she shifts focus with each chapter so that I felt I really got to know each of the members of the family. Claire is such an incredible heroine as she is faced with something so horrible, yet does not forget who she is in the process and in reality comes out a better and stronger person as she returns to some of who she was before she was married and living this dream life. Claire also has some amazing friends whom help her throughout this ordeal and I really loved them as well. I found myself trying to rationalize for Claire what she should do and I found it so easy to connect with the characters as they became so real in the book. Judging by the epilogue, I am guessing there will not be more books about the Massey family (I would love to spend more time with them! ); however I am looking forward to the next book that Kellie writes! Enter & RSVP today! A SEASON OF CHANGE KINDLE HDX GIVEAWAY & FACEBOOK PARTY! "A Season of Change" is an excellent start to the Seasons in Pinecraft series by Lynette Sowell and it is one that Amish fans will enjoy and romantic fiction fans as well! Jacob and Natalie are both filled with questions - questions about the past, questions about current circumstances, questions for God. As these two try to sort through details and figure out what path they should be on for their lives they are drawn closer to each other and also closer to God, but can they both find happiness and love and will it be together or as apart? I really enjoyed this story and the characters in this book as they are characters whom became so real and had to cope with trying times and work through dilemmas. This is such an unique setting for the story as well and not the "typical Amish story" backdrop or storyline and I love how it is based upon a real community. This is a story that will completely capture your attention and your heart as you become completelty immersed in the characters' lives and their story.